It’s Friday, 10pm, and I’m not a happy camper. 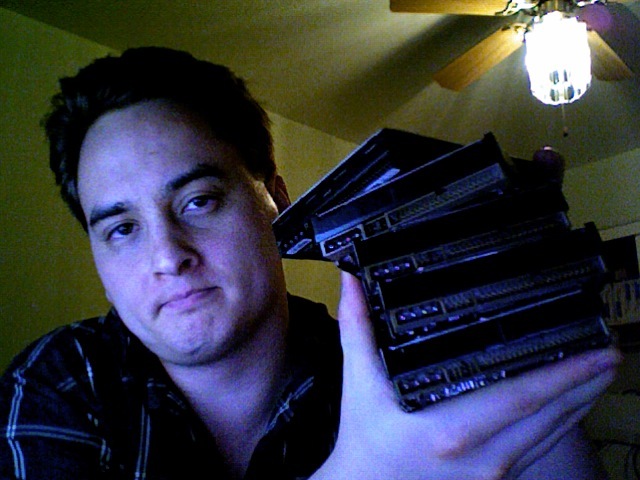 This picture is me holding a pile of ordinary hard drives I keep on my home desk. They are cycling backup drives and are not in any way frequently used. Four are Seagate Barracudas–one of which I’ve already had replaced–and the fifth a Maxtor DiamondMax. The oldest of the bunch appears to be from 2002 and all are PATA 200-250GB models. I’m unhappy because I picked them up tonight to run a very infrequent backup of all my household data: over a TiB worth while requiring the use of all of them for a complete home backup. Much too my dismay, I won’t be running any backups this weekend. I haven’t been this unhappy with a manufacturer since the last of my IBM DeathStars failed around 2003. Fortunately all the Seagate models are still under warrantee, but such performance is still disheartening and frustrating. What’s happened to quality drive manufacturing in the 21st century? Some of the ~10MB hard drives in my 486-era machines easily lasted 10+ years, but a single drive these days lasting over 3 seems ever more scarce. Sigh.